SIOUX FALLS, S.D. 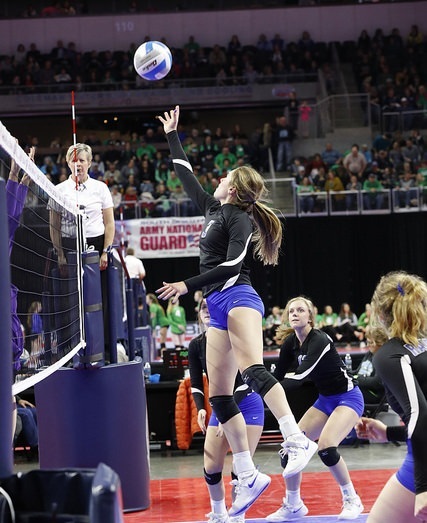 - Rapid City Stevens needed four sets, but got by Watertown Friday night to earn a berth in the Class AA State Volleyball Championship match. Stevens won their first set over the Arrows 25-20 and escaped with a hard fought 31-29 victory in the second. Watertown would come back and win the third 29-27 set forcing a fourth set, which Stevens won 25-16. Elizabeth Schaefer had 14 digs for the Raiders with Laura Petik adding 11. Defensively, Kyah Watson had 16 kills. Stevens will play Sioux Falls Washington for the title Saturday night after the Warriors swept Sioux Falls O'Gorman in three straight.